With the island currently experiencing an epidemic of dengue fever keeping those dratted mosquitoes away could never be more important. The little blighter responsible for spreading this nasty disease is the Aedes Mosquito. Under optimal conditions the egg of the Aedes mosquito can hatch into a larva in less than a day. The larva then takes about four days to develop into a pupa, from which an adult will emerge after two days. Three days after it has bitten a human and taken blood it will lay eggs and so the cycle continues. It is only the female that bites as it needs protein from blood to develop its eggs. The mosquito becomes infective approximately seven days after it has bitten the person carrying the virus. Thi is the extrinsic incubation period during which time the virus replicates in the mosquito and reaches the salivary glands. Peak biting time is at dawn and dusk. The average lifespan of the Aedes mosquito is two weeks. During that time they lay eggs around three times producing 100 eggs each time they lay. The eggs can lie dormant in dry conditions for up to about nine months after which time when exposed to favourable conditions, water and food, they will hatch. 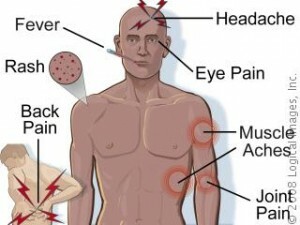 Dengue fever and Dengue Hemorrhagic Fever are the most common mosquito borne viral diseases in the world. Dengue fever is an illness caused by infection with a virus transmitted by the Aedes mosquito. There are four serotypes of this virus, DEN-1, DEN-2, DEN-3 and DEN-4. 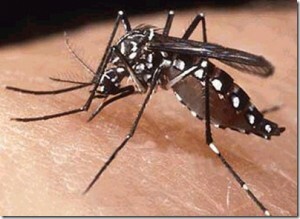 Dengue fever can only be spread by the Aedes Mosquito. There is no drug or cure for Dengue. The only way you can prevent dengue is to prevent the breeding of its carries. The Aedes mosquito can be identified by black and white stripes on their bodies, you can remove them from your home by getting rid of all stagnant water and frequently checking. In mosquito-borne diseases such as de ngue, transmission is sustained by infected mosquitoes and infected humans. An infected mosquito bites an uninfected person, infecting him. In turn, when the infected person is bitten by an uninfected mosquito, that mosquito could then spread it to other uninfected individuals. Repellent repels mosquitoes- that is, it reduces the chances of being bitten- but it does not mosquito-proof a person. In this light, repellent use offers individuals added protection against mosquito-borne diseases. In the community, it reduces the transmission of mosquito-borne diseases. Applying insect repellent is not the only way to protect oneself against mosquitoes; wearing long-sleeved clothing, using mosquito nets while sleeping and staying in mosquito-free rooms are good measures to prevent mosquito bites. Others include insecticide sprays and burning repellent oils. You should decide for yourselves on one or a combination of these. As well as traditional repellant there are other methods you can use to keep mosquitoes at bay. Mosquitoes are not active when wind gusts exceed ten miles an hour so create your own by keeping your fan on high. It has been scientifically proven that thiophenes, insecticidal compounds found in different species of marigolds, can kill mosquitoes. It’s hard to say if planting a bunch of marigolds around your backyard will expose the nasty critters to levels high enough to actually kill or deter them. Plant marigolds anyway, along with a variety of other native plants, herbs, and flowers; a biodiverse backyard will attract toads, dragonflies, hummingbirds, and other mosquito predators. And be sure to weed your garden and cut your grass frequently, so mosquitoes have less cover to hide in or rest on. The most effective way to control mosquitoes is to kill them before they have a chance to grow into bloodsucking adults. The most effective way to do that is to target their breeding grounds. “Mosquito dunks,” sold at most home and garden stores, contain a specific type of bacteria that’s harmless to humans but toxic to mosquito larvae, and can be used in birdbaths and decorative ponds. Eliminating sources of standing water will help, as well, since mosquitoes can’t breed without water. Empty kiddie pools when not in use, keep trashcans upside down during rainstorms, and keep rain barrels covered. Sometimes symptoms are mild and can be mistaken for those of the flu or another viral infection. Younger children and people who have never had the infection before tend to have milder cases than older children and adults. However, serious problems can develop. These include dengue hemorrhagic fever, a rare complication characterized by high fever, damage to lymph and blood vessels, bleeding from the nose and gums, enlargement of the liver, and failure of the circulatory system. The symptoms may progress to massive bleeding, shock, and death. This is called dengue shock syndrome (DSS). Doctors can diagnose dengue infection with a blood test to check for the virus or antibodies to it. There is no specific medicine to treat dengue infection. If you think you may have dengue fever, you should use pain relievers with acetaminophen and avoid medicines with aspirin,which could worsen bleeding. You should also rest, drink plenty of fluids, and see your doctor. If you start to feel worse in the first 24 hours after your fever goes down, you should get to a hospital immediately to be checked for complications.